Post times to comments. If you cannot do muscle-ups perform 120 pull ups and 120 dips. I’m not sure how many of you read the full article from yesterday, but it got me thinking about some problems we encounter in the gym. I think about what we do as something like bringing you back to your natural state. The movements we perform are foundational natural movements, but some of us are living anything but a natural existence! Stuck at a desk or in a cubicle all day, chopping food hunched over a counter, staring at a computer screen or sitting in our car for hours on end. Some day I plan on outlining the way the world should work, but for now I will just discuss some ways to prepare yourself for the rigors of the gym. Warming up prepares us mentally and physically for activity. Physiologically it induces a host of responses including increases in heart rate, stroke volume (blood pumped per heartbeat), cardiac output (blood pumped per minute), oxygen extraction by the muscles, blood pressure, pulmonary ventilation (amount of air moved per breath) and core temperature. The increase in core and muscle temperature increases the elasticity of muscle and tendinous tissues, increases nerve conduction rates, and increases the speed of muscle contractions. How do we know if it’s working? A light sweat is a good indicator of a successful warm up. We want your warm up fit you. Change squats to walking lunges, do GHD sit ups instead of floor sit ups or vice versa, climb the rope or practice your handstand. 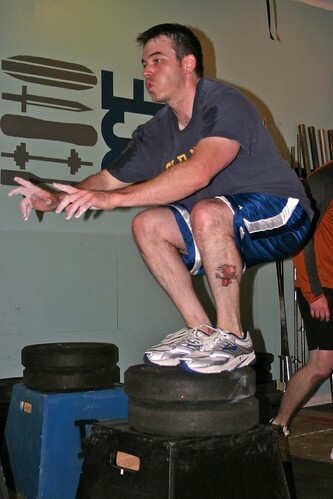 A big part of CrossFit is playing and challenging your skills. There is no right or wrong warm up. As long as you squat, push, pull, bend, and straighten, and use perfect form every time, the warm up is a great opportunity to not only prepare for the WOD but improve your skills and have fun.